LOS ANGELES (KABC) -- A rental car company in downtown Los Angeles is suing a rapper and another man over claims that they destroyed and abandoned a Lamborghini in West Hollywood. A rapper residing in Beverly Hills and known as NBA YoungBoy, whose real name is Kentrell DeSean Gaulden, is being sued along with a man named Desmond Hardnett, according to court documents. The plaintiff is Exotic Car Rental. The lawsuit claims that Hardnett rented a Lamborghini Huracan Spyder on June 27. 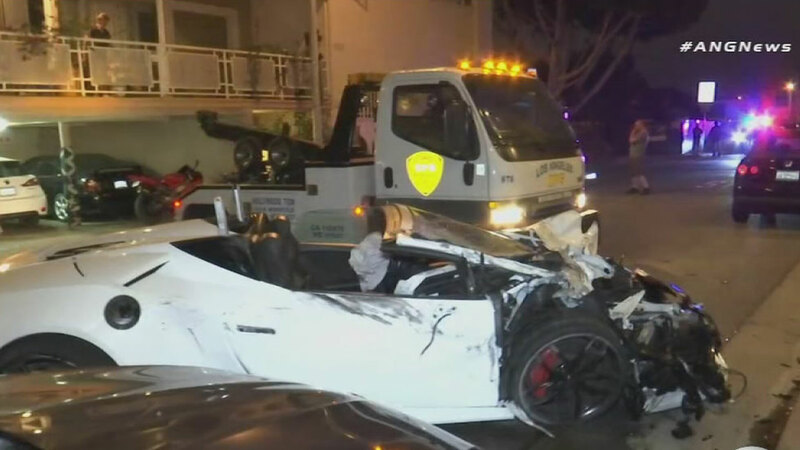 Two nights later, the Lamborghini was found abandoned and destroyed after authorities said it crashed into parked cars in the area of Romaine Street in West Hollywood. In the lawsuit, it said Hardnett signed an agreement stating he would be the sole driver of the Lamborghini. One of the allegations in the suit claims Hardnett let Gaulden drive the vehicle on the night it was found destroyed on Romaine Street, which violates the contract. The lawsuit states the rental car company hopes to recoup the costs of the damaged vehicle.